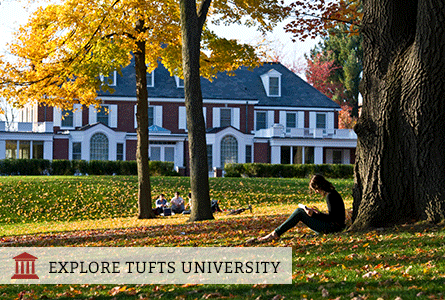 Tufts offers more than 150 majors and minors, ranging from popular options like International Relations and Computer Science, to unique programs in Civic Studies, International Literary and Visual Studies, and Film and Media Studies. Students study in our School of Arts and Sciences, School of Engineering, and School of the Museum of Fine Arts at Tufts. Through the SMFA at Tufts, students can pursue a Bachelor of Fine Arts (BFA) in interdisciplinary studio art, or a five-year combined degree BFA + BA/BS with the School of Arts and Sciences. The student-to-faculty ratio is 9:1 and approximately 70% of classes contain 20 students or fewer. Undegraduates may enroll in combined degree programs, special degree paths, and early admission programs with our graduate schools. At the Experimental College, students enroll in or teach small, participation-based courses that engage with ideas shaping the contemporary world, including issues in politics, popular culture, world religions, technology, law, communications, social issues, business, healthcare, ethics, and more. Tufts' Institute for Global Leadership provides educational opportunities to responsibly engage global issues through classes, global research, internships, workshops and simulations involving leaders from public and private sectors. Tufts is also home to the Jonathan M. Tisch College of Civic Life, a national leader in civic education and research. Through an intensive leadership program, summer internship experiences, a year-long service learning program, and other initiatives, Tisch College seeks to prepare students for a lifetime of engagement in civic and democratic life. fellowship within six months of graduation.